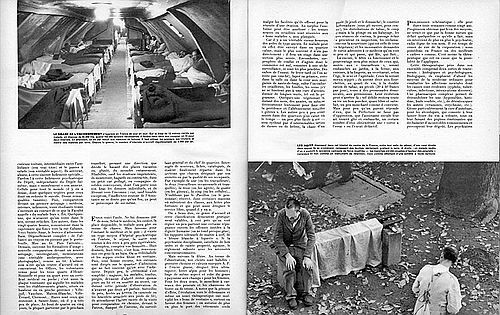 Magazine page layout for "Réalités"
In 1954 Jean-Philippe Charbonnier documented French Psychiatric hospitals and this photograph was a part of that series. Some of the photographs were published in Réalités in January 1955. In 2006 a 24 page booklet Jean-Philippe Charbonnier: HP hopitaux psychiatriques was published by Le traitement contemporain no 4 in conjunction with gallery Agathe Gaillard.